Football and Cricket. Arguably the two most popular sports in India, are extremely different. While one game is fast paced and can end in 90 minutes, the other game can be anywhere from 3 hours to 5 days and test the players’ patience and endurance skills. In spite of their differences, the star athletes of both the sports share some remarkable traits and characteristics. 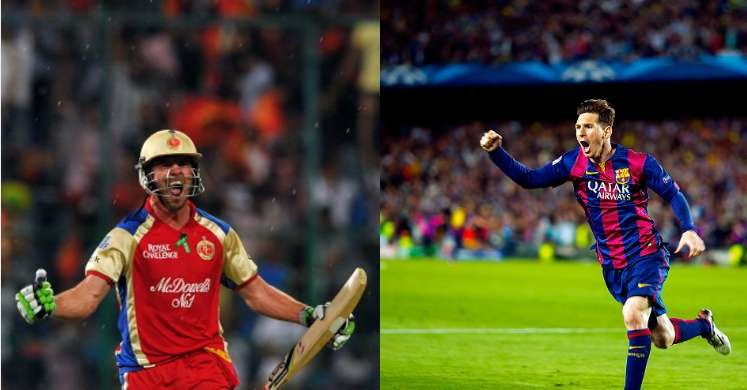 In this piece, we try to match 5 superstar footballers with their cricketing equivalents. Probably the two most talented players of their respective sports, Lionel Messi and AB de Villiers certainly have a lot of similarities with each other. While Messi can dribble, create goals, score stunning goals and even take breathtaking set-pieces, ABD can hit the ball to all corners of the park and he is known as Mr.360 for a reason. Capable of creating breathtaking moments on the pitch effortlessly, both ABD and Messi are true geniuses and are considered the best in the world. Messi has proved himself playing as a forward, false 9, through the centre and even in midfield. Similarly, the South African superstar has also proved himself to be the best no matter what format of cricket you consider. Despite all their achievements, skills and obvious talent, what makes these two supreme athletes so popular and loved around the world is their humility and sheer love of the game. Both Messi and ABD are once in a generation sportsmen and we should sit back and admire their genius at every opportunity we get.